Director – Jack Arnold, Screenplay – Harry Essex & Arthur Ross, Story – Maurice Zimm, Producer – William Alland, Photography (b&w, 3-D) – William E. Snyder, Underwater Photography – James C. Havens, Music – Joseph Gershenson, Makeup – Bud Westmore, Creature Designed by Jack Kevan & Millicent Patrick, Art Direction – Hilyard Brown & Jack Herzbrun. Production Company – Universal. A fossilised claw dating from the Devonian age is discovered, showing the existence of a creature bridging between early aquatic and land-life. A group of palaeontologists launch an expedition to travel by boat up a tributary of the Amazon to find more evidence. There they find as a very-much alive version of the creature, a semi-intelligent reptilian humanoid. It proceeds to trap the boat in a lagoon where it then taunts and attacks them. The Creature from the Black Lagoon was made a year after The Beast from 20,000 Fathoms (1953). The Beast from 20,000 Fathoms was a big success that created a vogue for prehistoric/dinosaur and atomically enlarged monster movies, something that became one of the most predominant themes of 1950s science-fiction. The Creature from the Black Lagoon was clearly an attempt to tap that success. It is relatively rarity among the films of this era in that it eschews the idea of a giant-size monster and brings the monster down to human-size, drawing on the influence of the earlier alien invader film The Thing from Another World (1951). (The design of the Creature was supposedly modelled on the Oscar statuette, would you believe). This is a clever move that allows the film to have its cake and eat it too without the need for costly stop-motion animation effects. Although in truth, the bit about the creature being a dinosaur is only window dressing, for at heart this is just another variant on the Frankenstein and Mummy films that were Universal bread-and-butter genre output in the previous decade. In fact, with the Creature’s inroads on Julia Adams, The Creature from the Black Lagoon is not a lot more than an incarnation of a good old Thrilling Wonder Stories cover with a tentacular monster and bikini-clad heroine. The Creature from the Black Lagoon was the second film directed by Jack Arnold, who had had considerable success with the alien takeover film It Came from Outer Space (1953), which came out a couple of weeks before The Beast from 20,000 Fathoms. The script trades in stock types – token female of the expedition, the villain killed off by his own greed. However, Arnold’s direction raises the script above the routine. Throughout his films, Arnold pit human beings in a metaphorical relationship with landscape. Humanity was constantly seen as a stranger in landscapes that resonated with the vastness of geological time. The mystery of the Amazon and alienness of the underwater environment are well conveyed here (although the film’s modest budget and locations that never venture beyond the studio prevent this from being all it could be). One particularly good scene is the display of aquatic aerobics that Julia Adams conducts, which the unseen Creature mimics beneath the surface, finally daring to reach up and touch her foot. Jack Arnold crafts the scene as a graceful ballet – and one that contains an undeniable underlying eroticism. In another striking shot, Arnold follows a cigarette that Julia Adams idly tosses overboard down into the water past the eyes of the watching Creature. The Creature from the Black Lagoon was originally shot in 3D and is sometimes shown in that format in revival screenings today. Seen flat, The Creature from the Black Lagoon is an ordinary monster movie, distinguished somewhat by Jack Arnold’s camerawork. Seen in its original 3D format however, that same monster movie is transformed into a work of extraordinary atmosphere with the 3D allowing some stunning depth photography. The lagoon becomes a world of mesmerisingly sinister atmosphere. The smooth mirrored waters that the camera glides over seem to hold dark and menacing secrets. Even the scenes in the creature’s grotto manage to transform a cardboard-looking set into an eerie netherworld. The best sequences are those swimming beneath the waters. It has a genuine feel as though one is there – which of course the camera is. 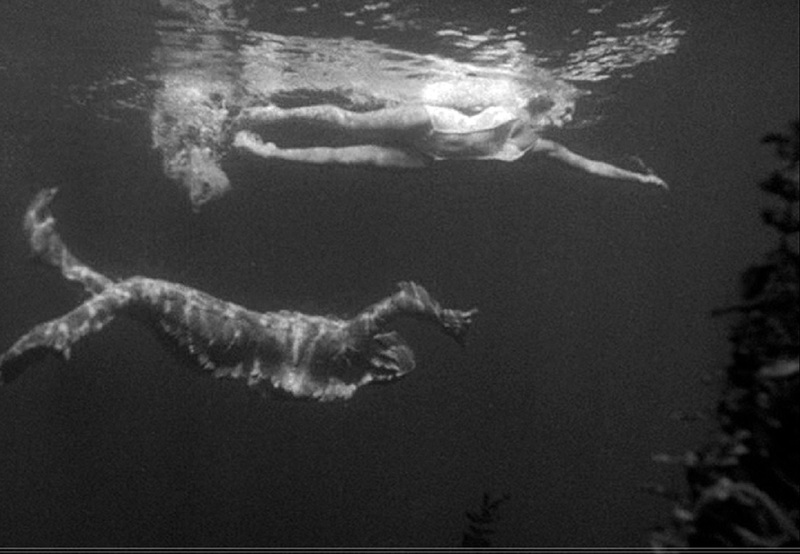 The underwater ballet between the creature and Julia Adams is the best scene in the film even when seen flat but in 3D it is spellbinding. When the 3D camera looks up from underwater at Julia Adams swimming, it seems as though she is floating in sunlight. The Creature from the Black Lagoon was an even bigger success than The Beast from 20,000 Fathoms and spawned two sequels – Revenge of the Creature (1955) and The Creature Walks Among Us (1956), both of which are worthwhile. In the 1980s, various directors such as John Carpenter, Joe Dante and John Landis planned a remake, although none of these ever emerged. In the 00s, a big-budget version has been announced from director Breck Eisner but this appears to have stalled. Guillermo Del Toro was one of those who was in talks but his idea in which the romance between the heroine and creature was fulfilled was rejected and so he went away and made his own version with The Shape of Water (2017). The Creature makes a brief appearance in the children’s monster bash The Monster Squad (1987) and was parodied in Saturday the 14th (1980) and Monsters vs Aliens (2009). Jack Arnold’s other genre films were:- It Came from Outer Space (1953), Revenge of the Creature (1955), Tarantula (1955), The Incredible Shrinking Man (1957), Monster on the Campus (1958), The Space Children (1958) and The Mouse That Roared (1959), as well as the story for The Monolith Monsters (1957). Screenwriter Harry Essex later directed two monster movies of his own with Octaman (1971) and The Cremators (1972), both being laughably impoverished.